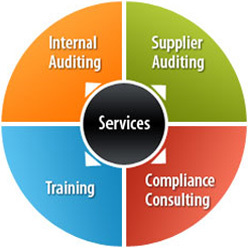 We provide worldwide auditing services for a wide variety of industries and standards including those listed below. If you’re interested in something not listed here just let us know and we will develop a package to meet your needs. ISO, FDA, and other industry regulations require that companies conduct regular (typically annual) internal audits of their Quality Management Systems. Quality Auditing LLC is well equipped to assist companies in the internal assessment of their own Quality Management System in relation to the requirements of one or more of these standard(s), and/or in-house requirements. We can be contracted to conduct either a complete internal audit of the entire QMS or a partial audit where our independent auditors focus on the specific areas of the quality system that would benefit from additional attention and/or cannot be conducted internally due to potential conflicts of interest. Our internal audits provides systematic and constant monitoring of your existing system, and help our clients achieve consistency as well as continual improvement. The scope of the audit is tailored to specific customer needs and requirements. We can conduct on-site supplier audits on your behalf to ensure that the activities you have contracted them for are being executed according to your requirements and applicable regulations. Supplier audits provide systematic and constant monitoring of your supplier’s systems, and help you to mitigate potential supply chain risk and drive continual improvement activities. The scope of our supplier auditing services can range from performance of a single audit to management of an entire supplier auditing program, including corrective action and follow-up. The proximity of our auditors to your suppliers anywhere in the world ensures that these audits can be executed quickly, with local experts who literally speak the language and know the culture. We provide QMS training to organizations interested in improving performance, minimizing risk, and avoiding the costly consequences of poor quality. We focus primarily on Quality Systems training but also offer customized training solutions for a wide variety of conformance and improvement methodologies such as Six Sigma, Lean, performance excellence, medical device quality and regulatory requirements, pharmaceutical quality and regulatory requirements, nuclear regulatory fundamentals, ISO 9001, ISO 13485, MDSAP, AS9100, ISO 14001, TS/IATF16949, ISO 17025, etc. Quality Auditing is ready to provide consulting to support the needs of your manufacturing or operations-based company. We are well suited to collaborate with you to ensure that we deliver marked improvements to your existing processes and exceed your expectations. We are available for work on projects of all sizes and look forward to the opportunity to develop a long term strategic partnership. If you don’t see the standard you’re looking for or need some additional guidance, contact us today and let us design an audit program to meet your needs. Next: Our auditors are the best. Learn why! © 2019 Quality Auditing. All rights reserved.